I am delighted to participate in the presentation ceremony of the National Awards for the Empowerment of Persons with Disabilities. Today, we honor differently-abled individuals, who by the strength of their indomitable will and their remarkable courage, have many achievements. Awards have also been given to Institutions, which have made outstanding contributions to the empowerment of persons with disabilities. Their work is exemplary and shows sensitivity to the needs of fellow human beings. This is an occasion to acknowledge the dignity and rights of Persons with Disabilities (PwDs) and to re-dedicate ourselves to their empowerment. Persons with disabilities, often face barriers for participating in all aspects of society. These barriers can take a variety of forms; those relating to physical environment or access to information, or those resulting from legislation or policy or from societal attitudes or discrimination. The result is that persons with disabilities do not have equal access in society to services, including education, employment, health care, transportation, political participation or at times justice. Experience shows that when these barriers to their inclusion are removed, persons with disabilities participate fully in societal life and the entire community benefits. Barriers faced by persons with disabilities are, therefore, a detriment to society as a whole and reasonable accommodation is necessary to achieve progress and development for all. We, as a nation, are committed to the full empowerment of persons with disabilities. The signing and ratification by India of the United Nations Convention on the Rights of Persons with Disabilities (UNCRPD), which came into effect in May 2008, symbolizes our resolve to move forward on the agenda to provide differently-abled citizens of our country with an environment for their full development and equal participation in the life of the nation. The Persons with Disabilities (Equal Opportunities, Protection of Rights & Full Participation) Act of 1995, is our main legislation dealing with persons with disabilities. The Government is in the process of replacing it with a more comprehensive new Legislation in consonance with the UNCRPD. I understand that this is a holistic piece of legislation which would entail major responsibilities not merely on the Central Government, but also on State Governments, local bodies, and even private service providers. I, therefore, urge the Government to complete the remaining stages of consultation expeditiously, and to introduce the Bill in Parliament as early as possible. As policy framework is strengthened, we must reinforce our efforts to have better delivery mechanisms for implementation of schemes and programmes, including through effective partnerships with the private sector and civil society. Effective delivery can be the only way in which we can see smiles on the faces of those affected by disabilities. I am happy to note that Government has created a separate Department of Disability Affairs last year. I wish the new department all success. I urge all State Governments to have a similar arrangement in order to give more focus to the issues confronting persons with disabilities. I also call upon the connected Union Ministries of Social Justice & Empowerment, Women and Child Development, Human Resource Development, Health and Family Welfare, Labour & Employment, etc. to work in unison to achieve the desired results.8. Persons with Disabilities must be enabled through education to get adequate opportunities for gainful employment and their rightful status in society. While the goal of inclusive and universal education is being pursued under the Sarva Shiksha Abhiyan, there is also a need to ensure that children with special needs have access to education, by providing the right kind of teaching-learning environment, material in accessible format and barrier-free educational institutions. There is, therefore, an urgent need to train teachers in adequate numbers to provide education to children with disabilities. We need to remove physical barriers that do not allow persons with disabilities to have access to various facilities and services. Various assistive devices are needed to enable persons with disabilities to lead their lives with independence. Simple aids like hearing devices, limb prosthesis, wheelchairs and Braille writing equipment facilitate mobility and communication, and substantially improve functional capacity. It is essential to make aids and computer software and accessories available to all persons with disabilities at a reasonable cost, so that they have equal opportunity for enhancement and actualization of their inherent potential. Given the widespread and growing use of the internet in various aspects of life, it is vital that at least all Govt. and public sector websites are made universally accessible. Economic empowerment of persons with disabilities needs focused attention. 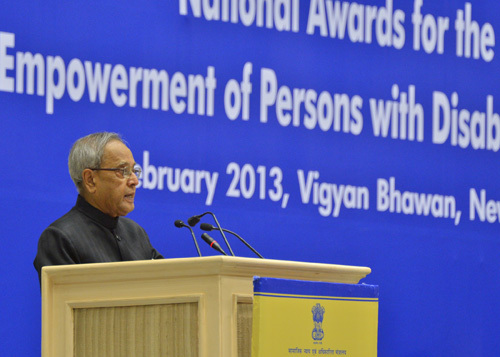 Government is mandated to provide reservation in employment to persons with disabilities. All Central Government Ministries and organizations under their control must take immediate and comprehensive steps to ensure that reservation for this category is effectively implemented in letter and spirit. Backlog of vacancies in all establishments in the Government Sector should be filled as early as possible. I also request the private sector to employ more and more persons with disabilities in their establishments and industries. I am happy that today we are awarding employers of persons with disabilities. This shows that private sector can also play a commendable role in appreciating their special abilities. There is a need to provide training to persons with disabilities so that they can acquire appropriate skills. The government as well as public and private sectors should work hand in hand to improve skill levels of persons with disabilities, thereby enhancing their employability. I am informed that a large number of States have not yet appointed full-time independent State Commissioners for Persons with Disabilities though this ombudsman institution is an integral part of the existing Persons with Disabilities Act and such a mechanism is also envisaged in the UNCRPD. I urge State Governments to appoint full-time independent State Commissioners for Persons with Disabilities at the earliest possible and to equip them with the wherewithal to function effectively for grievance redressal of the persons with disabilities. For many children, the presence of an impairment leads to lack of participation in activities that are part of a normal childhood. Women with disabilities are doubly disadvantaged on account of their gender as well as disability. Elderly persons with disability, in the twilight of their lives, are likely to be neglected and exploited. They need special consideration. While addressing the needs of those with disabilities, it is important that attention should also be on preventive measures. The possibilities of children in the 0 to 6 age group being afflicted by conditions that can lead to disabilities, can be reduced by precautionary measures such as immunization at the right age, control of diseases and infections, improvement of hygiene, better nutrition and better access to healthcare. Government anganwadi workers should be specially sensitized and trained to identify children with disabilities to facilitate earliest possible intervention. In conclusion, I congratulate the awardees and convey my best wishes to them for the future. My special good wishes to those awardees with disabilities – your awards make us all proud as you represent the spirit of hope, so essential for any society to progress. I hope you will inspire many more to come forward and work tirelessly in the cause of disability. Also award winning institutions have demonstrated dedication and commitment and their example will certainly encourage others to come forward to work tirelessly in our effort to make our society more disabled friendly. Let us all, on this occasion, pledge to do our best for the empowerment of persons with disabilities.